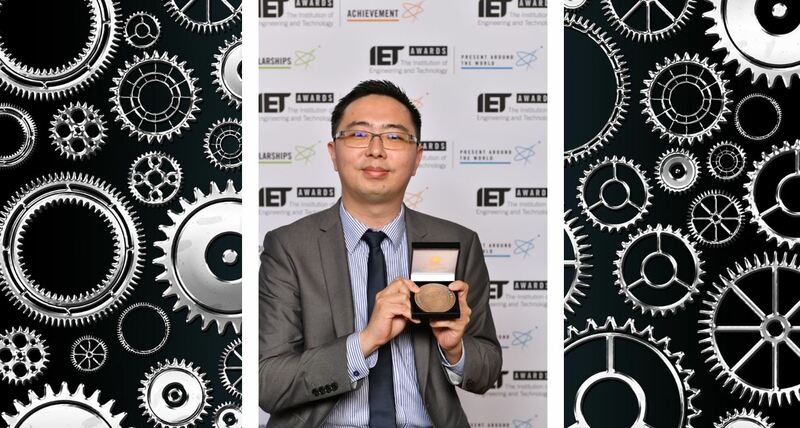 Dr John Tan Teng Hwang, MSc 2007, PhD 2014, from IET Malaysia Young Professional Section has been awarded the Paul Fletcher Award for Young Professionals, one of the Institution of Engineering and Technology’s (IET) prestigious Achievement Awards. Dr Tan was one of 14 of the world’s top engineering and technology individuals who were honoured with medals for services to the industry at a prestigious London award ceremony hosted by Dr Emily Grossman, the internationally acclaimed science author, public speaker and TV personality, on 14 November 2018. Speaking at the event, Professor Bernard Weiss, Chair of the IET Awards and Prizes Committee, said: “The Achievement Awards allow us to recognise the huge impact that engineers have on all our lives. Dr Tan was acknowledged for his ‘relentless drive and commitment’ which has lifted the IET Malaysia Young Professional Section to new heights since he joined in 2014. He was also recognised for ‘his leadership style’ which is based around coaching, instilling positive values, empowerment and recognition. Elected as Chair IET Malaysia Young Professional Section in September 2017, Dr Tan has worked tirelessly to realise his vision – to help close the gap between school, university and industry and to inspire more young people to enter a career in engineering. The Award which Dr Tan received is presented in memory of engineer Paul Thomas Fletcher, who wished to encourage the participation of younger people in engineering institutions and to reward their success in doing so. It is made annually to an IET volunteer for outstanding achievement in contributing to the activities of the Institution. An Assistant Professor, Dr Tan is currently Head of the Department of Electrical & Electronic Engineering, Faculty of Engineering, Technology and Built Environment in UCSI University, one of Malaysia’s first private universities, headquartered in Kuala Lumpur. He leads a team of 14 young professionals in Malaysia overseeing 15 IET ‘On Campus Groups’, three of which were formed in the past eight months. Under his leadership, the Network has grown from strength to strength, in terms of number of events organised, the recruitment of new members and engagement with student members. Dr Tan conducted the first IET Faraday Challenge in Malaysia and organised team building to link up Singapore and Brunei IET Young Professionals. In 2015 and 2017 he was the organising chair for ‘Present around the world’ in Malaysia. A former pupil of Chung Ling High School in Penang, Malaysia, Tan Teng Hwang earned a BEng degree from Liverpool John Moores University (2006), before moving to Queen’s to undertake an MSc Microelectronics (2007), followed by a PhD in Electrical and Electronics Engineering (2014). As a student he was a Committee member of EEECS (School of Electronics, Electrical Engineering and Computer Science) Research Society. He was also a Tutor and Lab Demonstrator at Queen's from 2010–13, which involved him collaborating closely with lecturers and technicians to prepare for laboratory demonstrations. The IET is one of the world’s largest engineering institutions with over 167,000 members in 150 countries. The most interdisciplinary – covering energy, transport, manufacturing, information and communications, and the built environment – the IET reflects the increasingly diverse nature of engineering in the 21st century. The IET Achievement Medals recognise individuals who have made an exceptional contribution to the advancement of science, engineering and technology in any sector or activity within the scope of the IET. The global Young Professionals Achievement Medal recognises outstanding work, significant career progress or contributions made to their industry or profession. The winners of these award receive a medal, certificate and a cash prize. For more on Electronics, Electrical Engineering and Computer Science at Queen’s, visit the School website or contact the EEECS Office in the Computer Science Building, 18 Malone Road, Belfast, BT9 5BN, tel: +44 (0)28 9097 4639.